Visit the World Heritage city Nikko on this 10-hour private taxi tour from Tokyo. 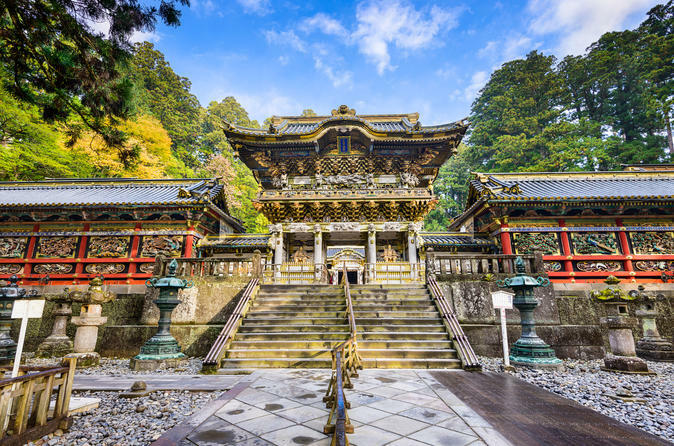 Nikko effortlessly blends shrines and temples with the surrounding nature creating an irresistible draw for Japanese and foreign tourists alike. Construct your own itinerary and let the English-speaking driver handle the rest! There are 2 types of cars available, a mid-sized passenger car or a mini-van. Both have heating and air conditioning systems. Tucked away in the mountains and the gateway to the National Park, Nikko is a perfect example of how buildings can harmonize with the surrounding nature. Nikko's shrines, temples and bridges complement the mountains, rivers, lakes and forests so well that UNESCO decided to designate the city's temples, shrines and its natural surroundings as a World Heritage Site. Nikko is arguably most famous for Toshogu Shrine, an unashamedly lavish shrine which includes the mausoleum of Tokugawa Ieyasu, the founder of the Tokugawa Shogunate. The sheer scale and architectural ambition that emanates from the shrine symbolizes the wealth and power that the Shogunate had at its peak in the 1600s. Nikkosan Rinno-Ji Temple and Nikko Futarasan-jinja Shrine are other leading attractions nearby. Another highlight of Nikko is Kegon Falls, a 97m waterfall considered one of the three great waterfalls in Japan. You can feel its powerful force from an observatory high up or get closer to it by riding an elevator to the base of the waterfall (additional fee required.) Nearby Lake Chuzenji is a scenic lake surrounded by mountains which will look gorgeous in the autumn months. Nikko is also well known for Yuba (tofu skin), an ingredient often used in 'Shojin Ryori' (Buddhist cuisine'), so it's a good option for lunch! The driver will pick you up at your chosen location within Tokyo's 23 special wards anytime between 08:00~11:00 (or 09:00 if you do not select a time) to begin your tour. Tell the driver where you would like to go in Nikko and that's it! The driver will drop you off at your chosen departure point within the allotted 10 hour period.